This is a Research Essay on the given topic I had done during the first semester of my Masters in Communication and Media Studies. The conclusions are based on my findings and my perceptions of how the industry in Silicon Valley evolved. I’ll be glad to hear any supporting or alternate views. It’s a long read. Thanks for your patience. Silicon Valley has long been known as the innovation and technology capital of the modern world. Housing some of the top tech companies, it has seen tremendous economic and creative growth since the 1970s. Silicon Valley Institute for Regional Studies (2017) shows that of the top 10 patent generating cities in the US, 6 are based in the Silicon Valley. 39 of the companies listed in the Forbes 1000 list are again based out of this Southern Bay area of San Francisco (Forbes 2017). As the manufacturing economy of Detroit fell in the 1960s, the innovation based economy of Silicon Valley grew. This shifted the complete focus of the US Government towards the region. Supported by the greatest minds of Stanford University, located near to the San Francisco Bay area, the support extended to the technical communities and graduates in the area grew by leaps and bounds. The all-round support from the government, academia and the industry played a major role in the growth of Silicon Valley as the pioneering face of technology. But this tech-fueled prosperity has seen a steep decline since the 1990s, owing to a multitude of reasons – technological, financial, economical and also in terms of the support system. In this essay, we will be discussing about the rise, fall and the reasons behind how the innovation culture of Silicon Valley has died since the late 1980s. The strength of research and development, be it in a company or in a government organization, determines the innovation rate in the specified economy. Unlike what Schumpetarain economists say that the money invested is directly proportional to the success of the research and development, it is in fact more of a Knightian uncertainty which states that innovation cannot be defined through a probability distribution (Mazzucato 2013, p. 65). Innovation is not just defined by how private organizations experiment and spend in R&D but is in fact a wider system. A system which consists of organizations from both public and private sectors, whose interactions directly influence the import, export, diffusion and acceptance of new technologies (Mazzucato 2013, p. 66). Knowledge is not to be stacked up as proprietary but needs to be diffused through the economy for better innovation. Most of the technological developments like computers, internet, civilian nuclear energy, biotechnology, jet planes and lasers were in fact a result of various government agencies working together – Pentagon, Atomic Energy Commission, NASA and the later created DARPA (Defense Advanced Research Projects Agency) (Mazzucato 2013, p. 76). The focus on basic and applied scientific and technological research by the Federal Government of USA was further pushed by the public with the recommendations of the Vannevar Bush report in 1945 (Mazzucato 2013, p. 77). As DARPA came to be formed in 1958, its focus was on advancing technological development, with ideas that might provide results only 10-20 years in the future (Mazzucato 2013, p. 78). This paved the way for scientists and engineers the freedom to experiment and innovate, a luxury companies in the Silicon Valley do not enjoy presently. And neither do they focus on. Be it the rise of Germany in the 19th century as a technological superpower or of USA in the 20th century, the common factor in both cases remains that they had in place a system of innovation, a network of inter-firm, regional and national cooperation, which brought forth new realms in innovation, rather than just defining it through R&D spending (Mazzucato 2013, p. 80). This intertwined network of systems was the major reason behind the previous success of Silicon Valley, and exactly what it is missing now. In the year 1955, Beckman Instruments Inc. established the Shockley Semiconductor Laboratory with semiconductor transistor technology inventor William Shockley as the lead. Shockley setup the lab in Palo Alto, California which eventually grew as the base of Silicon Valley – the name arising in 1971 by American Journalist Don Hoefler, due to the high concentration of companies situated there focusing on semiconductor technology, which relies on silicon element (Lojek 2007, p. 67). After the rebellious group of eight scientists (referred to as the Traitorous Eight) left Shockley’s Laboratory in 1957 and started up Fairchild Semiconductor, it became one of the major incubators of Silicon Valley and resulted in the creation of some of the biggest industry names like Intel and AMD. In total, more than 60 companies came to be born out of Fairchild, either as 1st generation or 2nd generation companies (Lojek 2007, p. 69). DARPA used this opportunity to seek support from the spin-offs as the smaller firms could be provided with smaller funds, rather than spending larger amounts on huge defense contractors. This also led to a boost in the number of spin-offs and other startups that came to initiate ground in Silicon Valley. Thus the government came to play a major role in mobilizing and inducing innovation among the smaller firms coming up in the Palo Alto area (Mazzucato 2013, p. 81). Stanford University also played a major role in the growth of Palo Alto region into the well known Silicon Valley. Ever since the 1980s, Stanford University leaders had a sense of strong regionalism into building the region around into self-sufficient indigenous local industry (Adams 2003, p. 523). Frederick Terman, Stanford’s Dean of Engineering and eventually well known as the Father of Silicon Valley, encouraged graduates and faculty to start their own companies. Thus, the beginnings of many companies that would later define Silicon Valley started off in the campus of Stanford (Adams 2003, p. 524). In further years, between 1955 and 1985 to be precise, various companies doing research in semiconductors supported the research and development in Stanford. Mainly Bell Labs, Xerox PARC, Fairchild Semiconductor and Shockley Semiconductor. Stanford Research Institute also operated one of the four original nodes of ARPANET, the predecessor of Internet (Adams 2003, p. 525). Frederick Terman also initiated the establishment of Stanford Industrial Park, where in order to focus on providing local employment opportunities to graduate students and supporting his vision of encouraging students to startup their own electronics companies, areas under the University were leased out to technology companies (Palo Alto History 2012). HP (Hewlett-Packard), established in 1938 under the mentorship of Terman, moved its offices to Stanford Park in 1954, thus paving the way into commercializing what would one day become Silicon Valley (Palo Alto History 2012). Other early occupiers of the Stanford Industrial Park included GE (General Electric), Eastman Kodak and Lockheed, all of whom eventually succeeded in making Silicon Valley the technology capital of the world in years to come (Palo Alto History 2012). In the 1950-1960s, defense and space technology bolstered the growth of Silicon Valley companies like HP and Varian Associates. Such projects helped build the technology infrastructure of the firms. In the 1960-1970s, after the invention of the Integrated Circuits, the semiconductor industry in the area shot up, eventually leading to the coining of the term “Silicon Valley”. With the invention of microprocessor in 1971, the next technological wave started, which paved the way for the development of Personal Computers in the 1980s (Henton & Held 2013, p. 544). The next three decades saw one setback each for Silicon Valley. In early 1990s, defense cutbacks followed as a result of the end of the Cold War, which led to economic withering. Global competition also started catching up with Silicon Valley companies then. In early 2000s, the internet bubble burst leading to severe unemployment and yet another withering of the economic situation. The third and latest blow came during the 2008 recession which severely impacted the technology companies. (Henton & Held 2013, p. 545). Back to back recessive economic environments shifted the focus of many companies from one of innovation to that of sustenance. The first clusters in Silicon Valley arose out of the collaborations with Stanford University and were derived from academic research. Even the initial companies like HP and Shockley Lab focused on shaping an interactive group of youngsters who could provide lasting contributions to science and technology. The triangular correlation between industry-academia-government also ensured that there was a definite push for technological innovation. As time went by and especially after the end of the Cold-War, once the US government withdrew its support from many industries, the decline in economic growth resulted in dampening the industry-academia connect too. The free-flowing industry-academic information exchange came to a slowdown and incubation at Stanford came to be discouraged (Etzkowitz 2013, pp. 525-526). Innovation in Silicon Valley was always a combined force, dependent on two pillars – government-industry supported research and university human-capital production. Now and especially since the 1990s, both these have declined resulting in the ecosystem being deprived of its growth trajectory and losing momentum (Etzkowitz 2013, p. 529). To better understand how innovation has stagnated in the Silicon Valley, a closer look needs to be taken at the top companies situated there. Of the 39 Silicon Valley headquartered companies listed in the Forbes 1000, 38 are in the computer (software/hardware) or internet business. Only Tesla stands apart, being into electric automobiles and solar panels. Of another 97 notable companies with significant presence in the Silicon Valley, more than 90% are into computer/internet based industry or into industries heavily dependent on them (Forbes 2017). This clearly showcases how the common trend since the 1990s has been to get onto the bandwagon and follow the herd with just minor alterations to the core idea. Of the list, multiple companies provide either the exact same or similar products/services. That is, after the invention of semiconductors, integrated chips and personal computers, no major technological innovation has risen out of Silicon Valley. After IBM’s personal computer in 1981 and Apple’s Macintosh in 1984, almost all innovations have either been based directly on the working modules of a computer or have been variations of them. Even the major technological focus fields of today, Artificial Intelligence and Virtual Reality, two areas many Silicon Valley companies are presently enthralled about, trace back their roots to well before the 1970s. Mobile Phones, which have seen a huge rise in popularity and features embedded, was first developed in 1973. The first mobile phone with a camera came to be developed by Softbank in Japan. Other developments, the Arduino Board and the Raspberry Pi also base their roots away from Silicon Valley (Computer History Museum 2017). In Italy and UK respectively. All technological development follows the hype cycle. Once the technology is triggered, it reaches the peak of expectations when the venture capitalists throw in all their money and the media hone in their spotlight on the technology. This is followed up with the disillusionment through super-saturation and the crash after which the company in the said field of technology refine their product/services to sustain in the market (Henton & Held 2013, p. 541). As this happens, the tendency of the company moves away from experimenting and innovation to one of sustenance and profit. This is what has majorly happened with most companies in Silicon Valley. While the big names have stuck to being a shadow of themselves in innovation, via minor advancements in technology, the smaller and newer companies are mostly reaping the benefits of the technological development that has happened with time. Innovation, in its purest form like the computer, internet, virtual reality etc. are no longer arising from the white boards of Silicon Valley. In the study by Global Innovation Management Institute conducted in 2016, San Francisco, including its southern area of Silicon Valley, came in the 9th place on the Top 10 Global Cities with Innovation (Kaminskaite 2016). This paradigm shift has arisen due to the vastly developing growth environment in other cities around the globe and the resistance to stagnation being adopted. The increasing availability of venture capitalism and support from government for startups has delivered positive results for others, while Silicon Valley slides down the list. 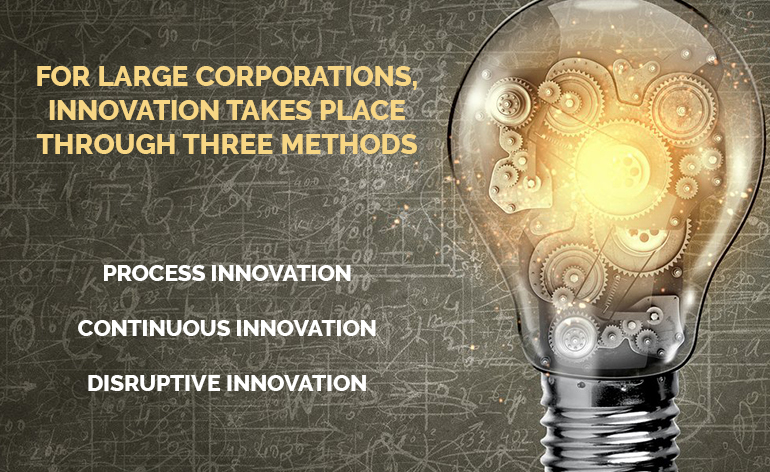 For large corporations, innovation takes place through three methods. Either Process Innovation where they work towards making their existing products/services better, Continuous Innovation where they follow the existing business model of the company but apply it to differing products, or Disruptive Innovation, where a completely new thing is invented which did not exist before (Henton & Held 2013, pp. 551). Companies like Oracle and Cisco are in the pipeline of Process Innovation whereas companies like HP, Apple and Microsoft follow Continuous Innovation. Of late, it’s only a few companies like Tesla who are presently on the path of Disruptive Innovation. Considering the history of the companies mentioned, each one started off with a disruptively innovative technology. Over a period of time, as the company grew and the prime focus shifted to profit and sustenance, the mode of innovation also changed. Tesla, which is a comparatively new entrant into the Silicon Valley list, is itching innovation with its Electric Cars and SpaceX initiatives, but even those are remediation of existing technological measures. Innovation has seen a downfall because most companies in the private sector are unwilling to invest in early-stage research due to the high costs being incurred and the indefinite time frame that is needed. As their major focus is on surviving the market and beating the competitor, more focus is on “pseudo-innovations” that are more feasible financially and do not gobble up a whole lot of time in research and development. This also results in companies pre-releasing their products while the market might not be ready for them – as happened with Nintendo’s Virtual Boy in 1990s and Microsoft’s Tablet PC in early 2000s. Another factor to be considered is the rate of acquisitions in Silicon Valley. Until the 1980s, spin-offs usually resulted in formation of whole new technological companies which further advanced innovation. Since the 1990s and especially since the 2000s, large corporations either acquire or acqui-hire smaller companies before even giving them an opportunity to define a business model for their innovation. In more than 90% of the cases, the acquisitions result in failure (Carroll 2014). Most of the said acquisitions happen for the startup’s intellectual property and less focus is given to how the technology can be developed in a disruptive manner. This has also resulted in the death of innovation, for the benefit of corporate “survival of the fittest” analogy. Adding to all these technological downfalls, there is another major reason that has contributed to the ruination of Silicon Valley in terms of technological innovation – Venture Capitalists. The obsession of the Silicon Valley companies with Venture Capitalists and the competition among them on who lands the better deal has overhyped the valuation of a good number of startups in the previous years, many of whom have ended in failure (Ries 2011). The competition between the VCs has also resulted in some of them ending the career of new founders just based on the grudge with another VC. And with funding flowing in without any borders, many startups directly focus on an idea rather than focusing on a prototype and a business model (Ries 2011, p. 100). In 2014, VCs pumped in $32 Billion into startups in Silicon Valley, more than twice as much as the rest of venture capital put into the rest of America (Maney 2015, para. 4). The number of people opting into entrepreneurship has also taken a hit, with 25 percent lesser people opting for it in mid 2010s, as compared to early 2000s. (Maney 2015, para. 6). These VCs are also creating a bubble for the Internet based companies like Uber, Lyft and Slack, which though have valuations running into the billions, aren’t presently generating any profit (Maney 2015, para. 9). The tentative valuation is based on a futuristic value of market share, if and when the competitors are vanquished. This tendency on behalf of the VCs has also resulted in many startups of recent years discarding innovation as their core concept to venture/angel funding as one. This shift in entrepreneurial mentality has also been one of the major reason why Silicon Valley has seen lesser technological innovation since the 1980s, but more number of Unicorn Startups. In conclusion, various factors have contributed to the death of innovation in the Silicon Valley since the late 1980s. The lack of Government support by no longer creating knowledge repositories through national laboratories and universities, or by initiating and mobilizing resources which allows knowledge to be diffused through the sectors and the economy (Mazzucato 2013, p. 69), has resulted in the lack of a network of knowledge hub. The industry-academia-government connect has also suffered a downfall, especially since the end of the Cold War in early 1990s and ever since academic institutions like Stanford University began to lessen their support of incubators. Patent wars have led to further dilution of the core ideologies on which Silicon Valley was built upon. Present day Silicon Valley companies are more focused on increasing the number of patents, patent wars and keeping information proprietary, which has resulted in non-diffusion of knowledge and hence stagnancy. The back to back economic blows in 1990s, early 2000s and late 2000s, which was the cause for shutting down of many companies, also shifted the focus of many of the Silicon Valley giants from one of innovation to that of sustenance. Adding to this, the pseudo-innovation bubble that the Venture Capitalists have created with hyper-funded startups has diluted the foundations Silicon Valley was supporting well into the 1990s. The race for angel/venture funding by startups resulted in the focus shifting from disruptive innovation to that of remediated pseudo-innovation. Looking back, the age of innovation of Silicon Valley ended with the advent of personal computers. All innovation since then has either been duplicated ideations or built upon the core concept of computers, remediated minorly into short term attractive propositions, without defining disruptive innovation, a concept Silicon Valley was expected to propagate since its inception. 1. Adams, SB 2003, ‘Regionalism in Stanford’s contribution to the rise of Silicon Valley’, Enterprise & Society, vol. 4, no. 3, pp. 521-543, (online Proquest). 8. Lojek, B 2007, History of Semiconductor Engineering, Springer, New York. 10. Mazzucato, M 2013, The entrepreneurial state: debunking public vs. private sector myths, Anthem Press, London. 12. Ries, E 2011, The Lean Startup, Crown Business, Massachusetts. Previous Previous post: Goodbye IZE Creative, Hello Australia – Vijay S Paul’s 2nd Innings.